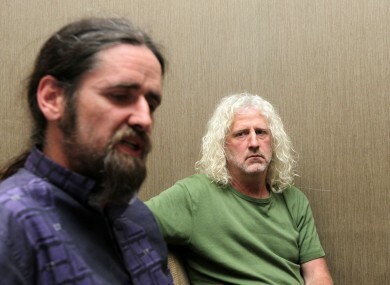 MICK WALLACE AND Luke ‘Ming’ Flanagan believe they were prevented from representing the Technical Group at Leaders’ Questions when the Dáil resumes next month and spoke of possible legal action, according to some independent TDs. Wallace and Flanagan were of the view that the Technical Group rotates representatives for the prominent speaking slot, but Stephen Donnelly and Séamus Healy were elected as speakers in a secret ballot before the summer recess and will question the Taoiseach and Tánaiste when the Dáil resumes in September. A number of TDs in the Technical Group have told TheJournal.ie that Donnelly and Healy were elected in a secret ballot that Flanagan and Wallace refused to take part in. Neither Wallace or Flanagan returned a request for comment. “They’re [Wallace and Flanagan] trying to say that some of us blocked them having their turn but the bottom line is that most people in the Technical Group are annoyed with Mick and Luke,” one TD, who did not wish to be named, said. Dublin-based TDs Finian McGrath and Maureen O’Sullivan both confirmed that Flanagan had spoken of taking legal advice after the meeting earlier this summer. “He [Ming Flanagan] did say at the last meeting that everything wasn’t set in stone with the two people that had been elected but what can they do? Murphy, a Kildare North TD and the group’s whip, refused to comment when it was put to her the Wallace and Flanagan spoke of possible legal action. Halligan said that while he had no problem with Flanagan, he does believe that Wallace has a “serious credibility problem”. “If he was doing Leaders’ Questions on all sorts of tax issues with the Budget coming up, it would be difficult to speak on tax when he would be just laughed at,” Halligan said referring to Wallace’s under-declaration of VAT and subsequent €2.13 million settlement with the Revenue. Maureen O’Sullivan said she disagreed with what she felt was Wallace and Flanagan being prevented from taking Leaders’ Questions. “There are some people of the opinion that certain individuals should not be able to do Leaders’ Questions. I am not of that opinion, we all have the same mandate,” she said. Donnelly said he knows that Wallace and Flanagan are unhappy but he had not heard anything since the last time the Technical Group met before the summer recess. He said he is looking forward to taking part in Leaders’ Questions although admitted the prospect is “nerve-wracking”. Email “'Mick has a serious credibility problem': TDs split on who does Leaders' Questions ”. Feedback on “'Mick has a serious credibility problem': TDs split on who does Leaders' Questions ”.